The square’s history is a teensy bit gruesome. There used to be a gate here, by the name of Stambol, where the ruling Turks would impale their non-Muslim subjects. Once that was destroyed in 1866 though, and once the National Theatre was built, the square slowly became more popular. 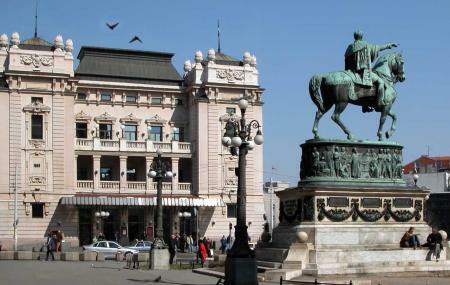 More buildings came up once the monument to Prince Mihailo was set up in the middle of the square (it was set up to honor the Prince after he successfully ousted the Turks from the city). It’s one of the busiest places in the city, and much of the city’s public transport passes through the square. One of the square’s main highlights is the Millennium Clock, which is made of chrome steel and glass. It’s a great place to people watch. The bars and café’s around this square can be a little expensive. In the summer, the square is hosts lively musical concerts. Most of the city’s public transport stops here. How popular is Republic Square? People normally club together Residence Of Princess Ljubica and Skadarlija while planning their visit to Republic Square.